In case you’ve never signed up for a website, here are the steps, made easy by yours truly. Visit the above link. Sign into your NaNoWriMo profile, or create a new one! Create your new novel to write in April. Be assigned into a cabin. That’s it. Once April starts, you can update your word count and check out your stats and everything! The best part about Camp NaNo? 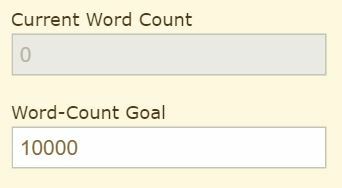 You can set your own word count goal. In November, it’s always 50,000 in one month. But here, if you only want to write a novella at 30,000, you’re golden! Your stats will reflect that goal appropriately. Don’t judge me. I just wrote 70,000 words. And as I mentioned before, unlike the actual NaNo, here they assign you into “cabins.” It’s basically a social space for writers you otherwise wouldn’t have known to talk about the craft, and everyone’s progress. It’s a great way to stay motivated! The forums on the original NaNoWriMo site will be up and running (as they are year-round), so they’re ready to fulfill any of your writing needs. If you don’t know what to write, never fear! Check out this forum thread for pages and pages of ideas. So what are you waiting for?? The world needs your novel!